salvage | It's Project Day! 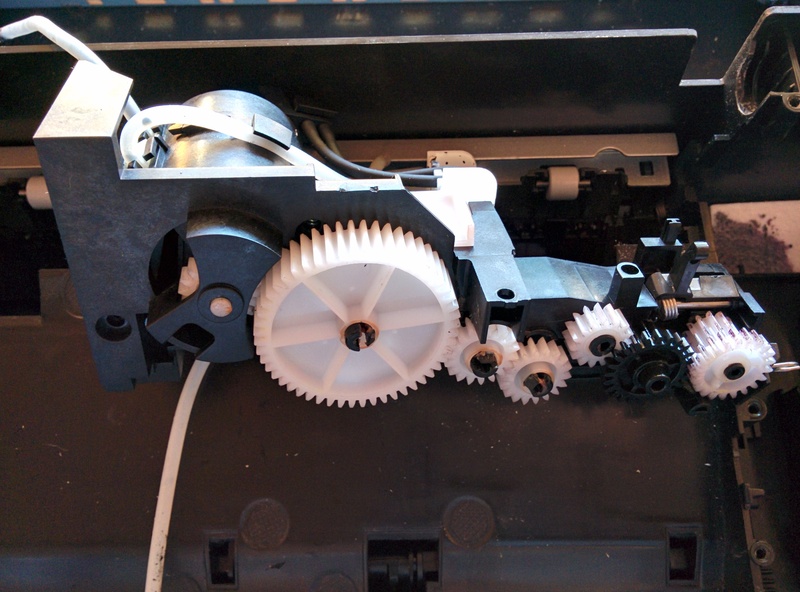 What do you do when your beloved printer, scanner, blender, or remote controlled car breaks? I’m glad you asked because this weeks’ post is about salvage. I’m going to use my experience to help you quickly sift through the junk and help you find the good stuff. ( sal-vij ) – To rescue or save from fire, shipwreck, danger, etc. In this sense of the word, I mean “to rescue the engineering from broken devices.” I know that seems a simple, but confusing turn-of-phrase, but I’ll break it down into two parts. First, I disassemble broken devices or more broadly, devices that people don’t want any more, so I’m not contributing to waste and I’m squeezing just a little more utility out of it than it would normally have. Second, I’m taking away from the device the engineering knowledge that I can glean from the arrangement of parts and the parts themselves to use in my own projects. From when I was a kid, I thought taking things apart was kind of a puzzle and still do. Since I’ve earned my degrees in engineering, I also look at each product I disassemble as a lesson in ‘continuing education’. You wouldn’t think about it just by looking, but a lot of engineering goes into the devices we use on a daily basis. Take a ‘simple’ motor for example, its an assembly of no fewer than 6 different materials brought together using additive (casting), subtractive (punching, machining, and polishing), and forming (sheet metal rolling, bending, and wire winding) methods which takes into account electricity, magnetism, thermodynamics, fluid dynamics, and mechanics. So why did the engineers that brought this product together select this motor? What are its special properties? Is it fast? Lots of torque? High voltage (low current)? What about the arrangement of the components? What decisions did the designers make to save money? What cleverness went into making the movement? What about specialty materials like the nichrome wire in toasters? I ask these questions almost reflexively when I take a look ‘under the hood’. 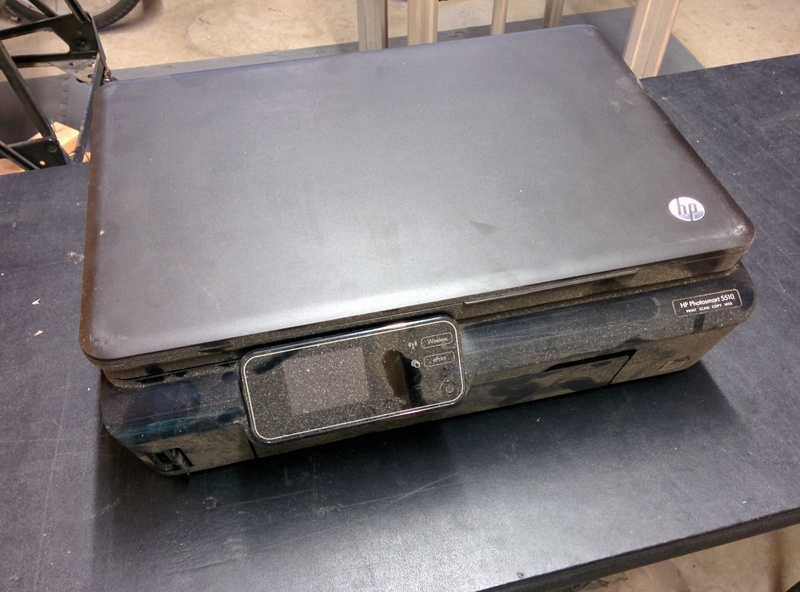 To help illustrate the process I use to salvage, I’ll refer to a tear-down I did recently of a HP combination inkjet printer and scanner that had stopped printing, given to me by my friend Farzan. Before I start taking a product apart, even before I bring it home, I try to figure out what parts I’m going in for. Lets face it, with places like Best Buy taking old electronics to recycle the e-waste, it’s far better for the environment to take it in than take it apart. (Maybe a peek inside the case before you take it in wouldn’t hurt) At the same time, also learn to recognize when something has no redeeming value and send it on its way. 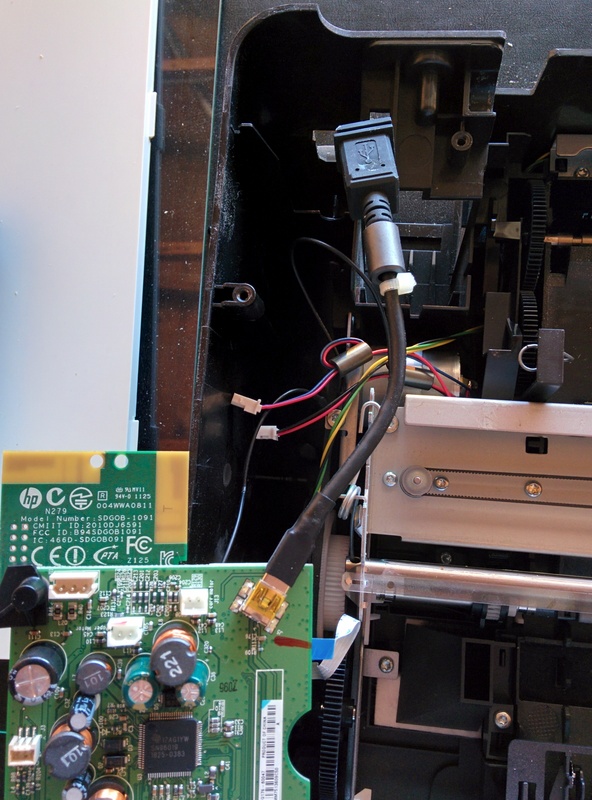 With the inkjet printer, I was sure from my experience stripping down other flatbed scanners that I’d find at least one stepper motor inside, a linear guide, and maybe a photogate or two. Knowing what you expect to find will inform how aggressively you can take the product apart. What I actually got out of the inkjet printer leads me to salvaging lesson number 1: When you salvage for parts, you don’t always get what you were expecting. I was really just blown away by how many interesting, useful things I was able to get out of this printer/scanner: 3 motors (1 with a linear drive belt and another with a built-in encoder), a fully enclosed dual-voltage 12V & 32V power supply (low current), screen with faceplate and bevel that I might be able to repurpose, peristaltic pump with bleed valve and drive gearing, wifi adapter card for experimentation (maybe), springs, rollers, USB cable adpater, button-cell battery holder, several photo gates, a pane of glass, and an SD card adapter. I already have two projects in mind using some of these components. Always exercise caution when taking an unknown device apart. Since you didn’t design it, you have no way to know what’s in it. The watch-outs I’ve seen are: springs that are stretched or compressed, so they go flying when they slip, unknown lubricants that get everywhere, glass and other pointy / sharp things, and the occasional glass tube filled with a gas. Especially when taking apart flatbed scanners, take care with the lightbulb which I think has mercury in it, but is only marked with the “Do not throw away” symbol. As a mimimum, I recommend safety glasses, but gloves and a well-ventilated area might also be a good idea. So, salvaging lesson number 2: Safety first… even though it’s mentioned second. Disassembly seems pretty straightforward, but a lot of the ease I have comes from experience. Over the dozens of products I’ve disassembled, I’ve dealt with glues, screws, tabs, catches, springpins, retaining rings, and press-fits, so I know how to recognize how a thing is held together. If you want the product to go back together, start your disassembly process with some pictures and continue taking them throughout. Next, if you’re salvaging for parts, I recommend only taking one part off at a time, when you do that, you get a better understanding of how the parts went together. Start by removing the screws because they are always obvious, but look before you pull pieces apart. A lot of the times, screws are used with tabs or slots or other things that make it easy for the assembly line worker (or robot) to slap parts together, but not easier for you to take apart. 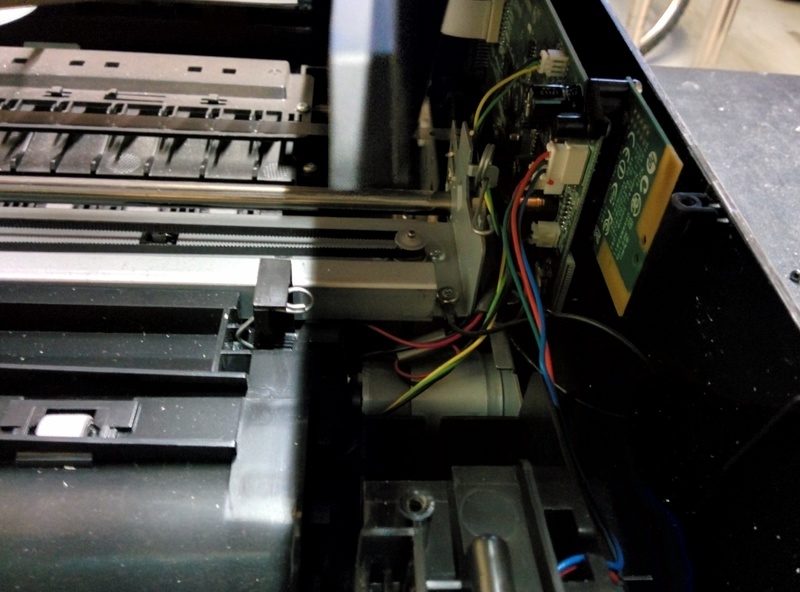 On the printer, for example, there were some screws hidden under stickers and some removable components. The first question I ask myself when I get a device open is “How does this thing work?” Seeing how the components are arranged and how they work together will help you understand the general operation of the device. This will help you figure out which parts you want to keep, find the parts you want, and help you understand the decisions that went into the design. During this ‘inspection phase’ is where the whole thing becomes a fun puzzle for me. Did the designer make the same arrangement choices I would have? Did they choose the same kinds of parts I would have chosen? Why is that part black and the others white? Is there something special about that connector or this wire or the thickness of the plastic? In general, recognizing differences and figuring out why it’s different is the name of the game. I found a lot of interesting things inside the HP printer. It had a peristaltic pump I wasn’t expecting, included no stepper motors (I was shocked), had a fully-enclosed DC power supply inside the printer case (like Russian nesting dolls), and had a USB jumper that went from a mini B USB port on the board to the standard B port on the case. All of these things were very surprising. I was also in awe of the sophisticated mechanisms used to drive the printing process: I found that through a set of clutches and sliders, the two motors in the printer were able to control two discrete roller movements to draw up the one sheet of paper and keep it moving smoothly past the print head while in a completely different mode, drive the peristaltic pump to (I assume) clean the print heads when they are in the home position. Just remarkable! That makes lesson number 3: If all you get out of a disassembly is the knowledge of how things are put together, then you win. Once you’ve convinced yourself that a part is useful, make sure to take a picture of it in its ‘natural environment’ before diving in. This reference will be a huge help later when you try to build with it. Also, consider what components are upstream and downstream of it. 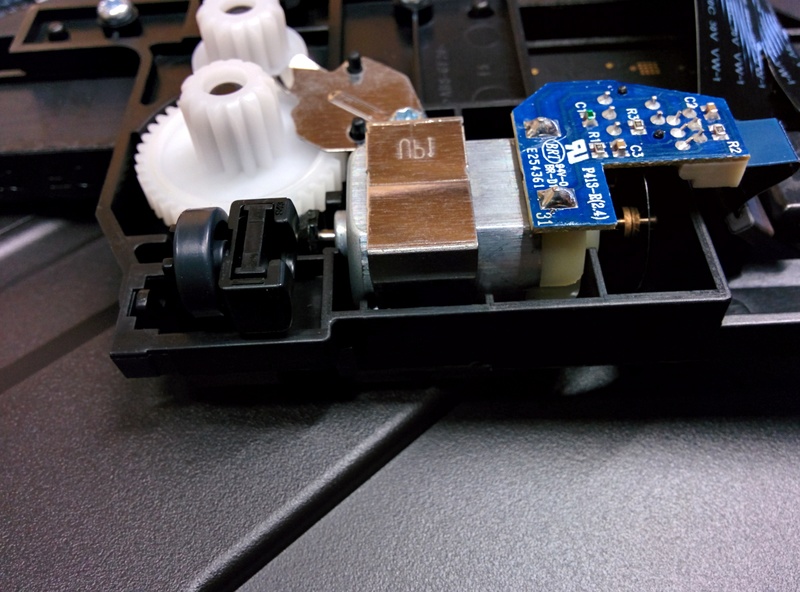 I pulled several motors out of the printer and with those, I had to consider if there was a motor controller built into the circuit board for me to use or if the mechanical linkage on the shaft was useful. 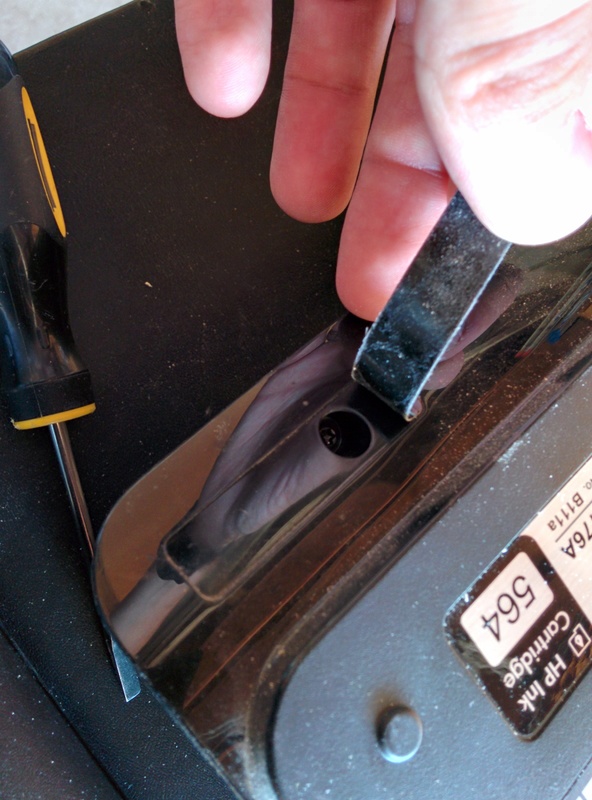 Finally, after you pull the component out, make sure you don’t have to save the mounting hardware. I’ve spent many, many hours trying to find the right screw to fit the thread pattern and length on the end-cap of many DC motors, so take some advice and save the mounting hardware. Lesson 4: Save the screws. After you’ve learned all you need to learn and taken all there is to take, what happens to the left-overs? Depending on what was removed and how much is left, there are lots of options. Generally speaking, I want to consider the environment as much as possible, so my hierarchy for disposal is: reuse, recycle, and then toss if you have to. In the case of computers and peripherals like this printer, if you only take one or two things like a motor or something, you can still button it all back up and turn it in at places like Best Buy and they’ll recycle the e-waste. If all you have are a few body panels, it would be okay to recycle them or throw them out if necessary (that’s what would happen to them if they went to Best Buy anyway). Take care not to throw out anything hazardous like that mercury lamp I mentioned earlier or batteries, etc. For those, check with your waste management company to find out how to dispose of those properly.